The station terrace in Rolandseck provides open views of the picturesque Rhine landscape and the fairy-tale mountains of the Siebengebirge. 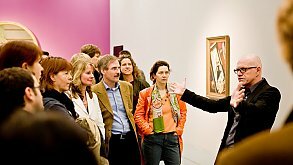 But apart from the traditional Rhine Romanticism, contemporary art has quietly conquered the region too. 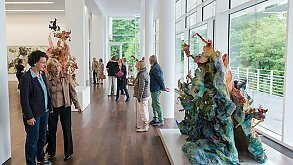 Entirely in line with the views of the artist duo Hans Arp and Sophie Taeuber-Arp, art pervades life and is omnipresent throughout the entire region. What is that doing here, some visitors may think as they gaze across the Rhine and spot the imposing Neo-Classical station building. The surrounding area would hardly lead them to guess that Rolandseck once had to deal with large numbers of passengers passing through. The prosperous Rhineland families who spent their summer holidays on the picturesque banks of the »Nice of the Rhineland« did not want to have to do so without an appropriate traffic link with Cologne and Koblenz. And where today the main road now runs, there was once a succession of hotels to cater to visitors wishing to experience the Romanticism of the region. With forested mountains behind you, you will find yourself gazing across towards the Siebengebirge and the Rhine islands of Grafenwerth and Nonnenwerth. Immediately to the north lies a symbol of Romanticism, the Rolandsbogen. The ruined archway is a reminder of the tragically romantic love story of the knight Roland. Today's visitors are still enchanted, and in fact from the very beginning it made the station building a popular meeting place and setting and served as inspiration and reference point for countless artworks. The links with art have continued with the museum complex, and they also run over into the surrounding countryside. Since 2001 the Remagen Riverside Sculpture Park has enhanced the kilometres along the Rhine between Kripp and Rolandswerth with selected artworks. The Riverside Sculpture Park forms part of the famous Rhine cycle path, which also passes Rolandseck on its way from the region around the source of the Rhine in the Swiss Alps to its mouth in Rotterdam. 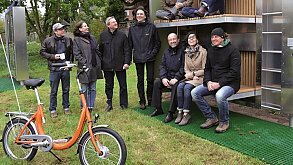 If you do not arrive by bicycle you can still take advantage by renting a bike locally. This will enable you to join the guided cycle tours which provide visitors in search of extra knowledge with more background information. 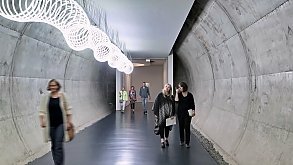 And it provides a completely new way to experience art, inviting cyclists and hikers to pause for a while. The way the art spills out into the landscape is also an invitation to communication, and presents the Arp Museum not as an elite isolated building in a picturesque setting, but rather encourages visitors to exchange views and make new discoveries together. Or will you be arriving by helicopter? That is no problem either, because thanks to the »arp heliport« by the artist Res Ingold the Arp Museum is also easy to reach by air. 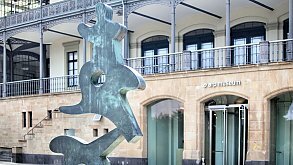 The central links between Bahnhof Rolandseck and Cologne and Bonn, and Koblenz and Mainz, are also an advantage since these cities also attract visitors with their own cultural highlights. Those who want to answer the call of the wild will put on their hiking boots and set off along the wild and romantic Red Wine hiking path or the historical Rhine Castle route. The world's highest cold water geyser in Andernach presents a unique natural spectacle. Or you could visit the »secret gardens of rolandswerth«, which combine nature and sculpture to create an artistic ensemble in historic Hentzen Park. And anyone interested in modern history will make a detour to the former government bunker at Ahrweiler, which today serves as a museum documenting a remarkable chapter of the Cold War.